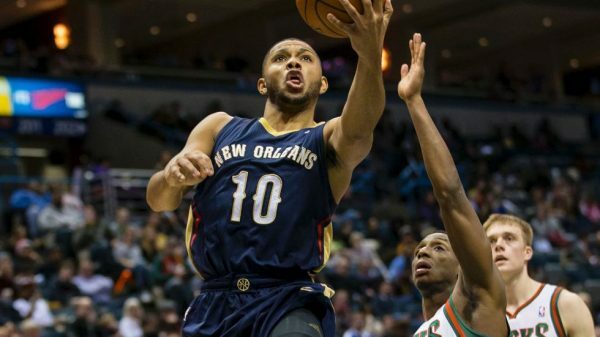 After five disappointing seasons with the New Orleans Pelicans, Eric Gordon is hitting free agency, and there’s still injured for the oft-injured shooting guard. The Pelicans would like to keep him, while the New York Knicks, Houston Rockets and Memphis Grizzlies are also interested. Signing a then eye-popping contract with the Pelicans (Hornets at the time), Gordon hasn’t lived up to the expectations of becoming one of the best shooting guards in the NBA. Injuries have often gotten in the way. He played 78 games in his rookie year with the Clippers, but since then, has never been on the floor for more than 64 games. He played in just 45 games last season, and has appeared only 221 times in New Orleans out of a possible 394. And with the injuries came the fall to mediocrity. He did average 15.2 points per game last season, slightly better than last season, but he’s no longer a 20-point per 36 minutes kind of guy. He continues to be an inefficient shooter (41.4% from the field over the last two seasons), who is quite useful from long range, when his shot selection is on point. Bringing up his volume of three pointers, he has made 41.7% of them over the last two years. A starter during his time in New Orleans, Gordon might be heading into a new stage in his career in terms of role, depending on the team he signs for. The Pelicans know better than anyone what he’s worth, and might be interested in switching up things in the backcourt after a disastrous 2015-2016 season, which was bad not just due to injuries. Tyreke Evans is on the team for another season, and if he’s healthy, he might be a better option at shooting guard. The Knicks need someone next to Derrick Rose, and Gordon could be an interesting partner in the backcourt. The Grizzlies are kind of empty right now besides Marc Gasol and Zach Randolph, so any kind of help would do. In Houston, Gordon, who played more small forward last year than ever before, could fit in nicely with what Mike D’Antoni has in mind. However, with James Harden on the team, Gordon could be used more as a sixth man than a starter, unless they turn him into a small forward, which could be a problem defensively. Gordon himself has said a number of times he’d like to stay in New Orleans, but obviously, the money makes a difference.